Panasonic is using IFA to show off a 85 inch full-HD plasma, with the TH-85PF12U up for grabs for a mere £18,600. The price tag of $30,000 may put off some, but the Panasonic TH-85PF12U does bring the company's Neo plasma technology, which allows a weight of only 260 pounds (117kg). 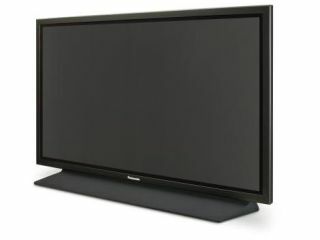 "Even with effective wide-screen dimensions of 74.4 inches by 41.8 inches, the TH-85PF12U is significantly thinner and lighter than past plasmas, with a main body depth of 3.9 inches and an overall weight of approximately 260 pounds," boasts Panasonic. The screen uses Panasonic's Neo PDP technology, but being the size of four 42 inch plasmas stuck together, it remains to be seen if the picture quality, even in full HD is worth the expenditure. Big screens at major shows are nothing new – and this certainly isn't vying to be the biggest, but Panasonic has proven that quality counts in the past, and this TV set may be a harbinger of what is likely in the coming years.